Introduction Childhood hearing loss has implications for school achievement, economic outcomes and quality of life. This study will engage rural Alaska communities in research to improve the school hearing screening and referral process, partnering with stakeholders to develop a locally derived, evidence-based solution to improve timely identification and treatment of childhood hearing loss. Methods and analysis Mixed methods community randomised trial in 15 communities in the Norton Sound region of northwest Alaska. Data collection will span from April 2017 until February 2020. Qualitative and mixed methods components are described in this protocol and the community randomised trial in the companion protocol. Focus groups and community events will be held leading up to the randomised trial to obtain community perspectives on childhood hearing loss in Alaska and elicit community input during trial protocol refinement (exploratory sequential stage). Stakeholder groups, including parents, children, teachers, school administrators and community health aides, will participate, along with community leaders, tribal leaders and community members. The randomised trial will be combined with qualitative, semi-structured interviews to elicit stakeholder perspectives on the intervention (explanatory sequential stage). The five stakeholder groups described above will participate in interviews. The study will conclude with additional focus groups and community events to discuss results and provide community insight for future implementation. Concluding focus groups will include policymakers, healthcare administrators, and tribal and community leaders in addition to the stakeholder groups. Informed consent and child assent will be required. Recordings will be transcribed and deidentified, with only stakeholder group recorded. Analyses will include categorical coding as well as narrative and thematic analysis. Ethics and dissemination The Hearing Norton Sound study has been approved by the Institutional Review Boards of Alaska Area, Norton Sound, and Duke University, with trial registration on clinicaltrials.gov. Study results will be distributed with equal emphasis on scientific and community dissemination. Trial registration number NCT03309553; Results. Community and stakeholder engagement are fundamental elements of this study, informing the design and refinement of the community randomised trial protocol, execution of the trial and interpretation and dissemination of trial results. The mixed methods design will bring community involvement to the forefront of developing an evidence-based solution to address childhood hearing loss in rural Alaska. A limited number of individuals will participate in the qualitative components of the study, and there is a risk of misconstruing or misinterpreting participants’ ideas. Limitations are counterbalanced by the insights gained from participants, who provide the context and understanding of processes that will be invaluable for drawing conclusions from the trial and implementing findings. The approach in this study may serve as a model for community-based research in the State of Alaska and in other rural communities in the USA and abroad. Childhood hearing loss is more common in rural Alaska than the general US population.1 2 The implications are tremendous and lifelong. In early childhood, a child with hearing loss may experience delayed speech and language development.3 Deficits continue into school age, with children affected by hearing loss performing worse in school than their peers.4–6 As adolescents, they are more likely to drop out of school early, experience social isolation, and have diminished quality of life.4 7–9 As children with hearing loss grow into adulthood, they are more likely to have low income and be unemployed or underemployed.10 11 Yet the majority of hearing loss in rural Alaska is infection-mediated, arising from chronic otitis media that is highly prevalent in the Alaska Native population.1 12–14 In summary, hearing loss is a preventable health disparity that can keep a child from living an empowered life with access to all opportunities they might otherwise receive. The state of Alaska mandates school hearing screening, an essential step in identifying children with hearing loss.15 It is unclear how effective the current screening protocols are however, and loss to follow-up in the referral stage is a persistent problem. The purpose of the Hearing Norton Sound study is to improve the school hearing screening and referral process in rural Alaska to ensure that children with undiagnosed hearing loss are identified and treated promptly. Yet without consideration of the contextual factors that influence uptake by families, schools, providers and organisations, we recognise that even the most effective interventions are unlikely to lead to substantial change in public health outcomes. Community and stakeholder engagement are therefore fundamental to this project, influencing each step in the process from study design and protocol development to implementation after conclusion of the randomised trial. An Alaska stakeholder team that brings patient, parent, educator, provider and Alaska Native perspectives has been involved from the conception of the project and helped to shape the research questions and study design. We will use an exploratory sequential design in which a qualitative stage is followed by a quantitative stage, with focus groups and community events held leading up to the community randomised trial to elicit community perspectives on childhood hearing loss in Alaska and incorporate stakeholder and community input during trial protocol refinement. Within the randomised trial we will use an explanatory sequential design, in which a quantitative stage is followed by a qualitative one, in order to gain further understanding of stakeholders’ values and experiences with the school screening and referral processes tested in the community randomised trial.16 17 Concluding focus groups and community events will be held to discuss study results and gain community insight on findings, providing context for future implementation of study results across the state. The purpose of this research is to improve the school hearing screening and referral process in rural Alaska to ensure that children with undiagnosed hearing loss are identified and treated promptly. The study is funded by the Patient-Centered Outcomes Research Institute, a non-governmental organisation that supports patient-centred comparative effectiveness research, and represents a collaboration between Norton Sound Health Corporation, Duke University, and Johns Hopkins University. The community randomised trial portion of the Hearing Norton Sound study is described in the companion protocol.26 This protocol focuses on stakeholder and community involvement, with the following specific aims. Create a patient-centred dialogue on hearing loss in Alaska communities through focus groups with parents/caregivers and other stakeholders to provide an opportunity to incorporate additional community perspectives into the qualitative interview topics and study protocol designed by our stakeholder team. Explore, using qualitative methods, the responses, experiences and insights of patients and stakeholder groups participating in the two school-based screening and referral processes. This will include semi-structured interviews with children, parents/caregivers, teachers, healthcare providers, and school and healthcare administrators to understand patient, family and organisational perspectives at each step in the screening and referral process. Discuss study results and perceptions of major findings through focus groups and community events with parents, stakeholders and Alaska policymakers. The Hearing Norton Sound project represents a community partnership with stakeholders serving alongside researchers, working together to address childhood hearing loss in rural Alaska. The entirety of this mixed methods protocol is dedicated to describing community involvement in the project, spanning from the Alaska stakeholder team’s role in planning to community and stakeholder engagement through qualitative components of the study and community-based dissemination of results. Our Alaska stakeholder team comprises respected members of their communities who bring patient, parent, educator, healthcare and Alaska Native perspectives and values to the study team. Roles represented on the team include a communications outreach specialist, lead parent stakeholder, patient partner, lead education stakeholder, lead audiology stakeholder, lead surgery (ear, nose, throat) stakeholder and lead hospital administration stakeholder. Our stakeholder team has been integrally involved in all aspects of project development, participating in weekly meetings throughout the planning process. The initial research question came directly from the stakeholder team. Stakeholders guided selection of study design and contributed to applications for funding and ethical review. Stakeholders also named the project, selected additional stakeholders to join the team and developed the research agreement with Bering Strait School District. Their leadership is reflective of the centrality of community involvement and values in this research. The Alaska Native people have been subject to historical trauma that has resulted in a distrust of research.27–29 Our hope is that the focus on community involvement and sustained stakeholder leadership will begin to assuage those fears in this project. In light of the sensitivity of research in rural Alaska, our stakeholder team supports deidentification of the qualitative components of the study, with only stakeholder group (eg, teacher, community health aide) reported. This will offer less information than is commonly available in qualitative studies, but we believe it is essential for obtaining authentic information and is more reflective of a culture that values community over self. The Norton Sound region encompasses approximately 23 000 square miles in rural, northwest Alaska. The regional population of 9875 includes 15 rural communities along the Bering Sea and the regional hub of Nome (figure 1).30 Nome city, with a population of >3600, has its own school district and the regional hospital located within the city. The Hearing Norton Sound study focuses on the 15 surrounding communities in the region, which range in size from approximately 100–700 individuals. These 15 communities comprise the Bering Strait School District, our educational partner in the project. The Norton Sound region of Alaska is remote and has no road system, with communities only accessible by plane, helicopter or snow machine. The population of the Norton Sound region is approximately 75% Alaska Native.30 Three tribal groups are represented: Inupiaq, Yup’ik and Siberian Yup’ik. English is spoken in all schools in the region. Four geographic strata were developed by our stakeholder team to balance regional differences in geography, community size and culture: southern communities (Stebbins, St. Michael, Unalakleet), middle communities (Elim, Golovin, Koyuk, Shaktoolik, White Mountain), northern communities (Brevig Mission, Diomede, Shishmaref, Teller, Wales) and St. Lawrence Island (Gambell, Savoonga). The qualitative and mixed methods portions of the Hearing Norton Sound study are summarised in table 1. Data collection will span from April 2017 to February 2020. The study will begin with focus groups and community events to obtain community perspectives on childhood hearing loss in Alaska and integrate stakeholder and community input during protocol refinement. 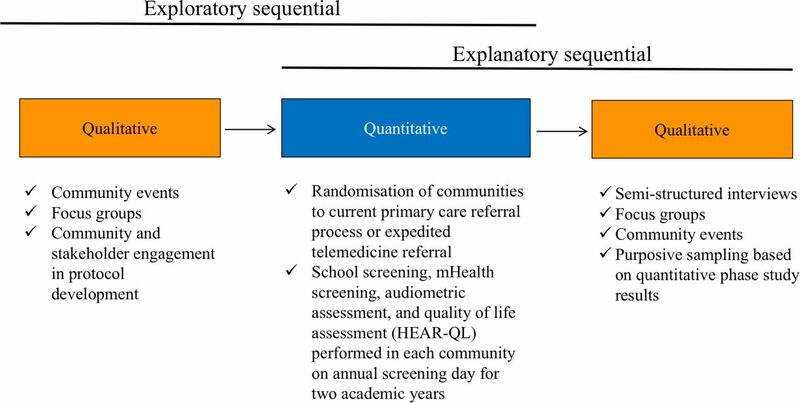 This exploratory sequential stage will be followed by an explanatory sequential stage that will integrate a comparative effectiveness community randomised trial (RCT) on school-based hearing screening and referral with qualitative, semi-structured interviews to gain patient and stakeholder perspectives on the intervention (figure 2). The randomised trial is detailed in the companion protocol, including a description of the primary care referral and expedited telemedicine referral processes being compared.26 Focus groups and community events will be held again at the conclusion of the trial to discuss study results and gain insight into community perceptions of major findings. A timeline for the qualitative and quantitative components of the study is provided in figure 3. Timing of qualitative and quantitative data collection in the Hearing Norton Sound comparative effectiveness community randomised trial. EMR, electronic medical record; ICD-10, International Statistical Classification of Diseases, 10th Revision; mHealth, mobile health. A minimum of eight focus groups and community events will be held before and after the RCT.31 In this region, it is common to hold public meetings or forums in local community halls. Community events will be held in these public spaces, where food will be offered and community members can gather. With informed consent, we will ask questions about the importance of hearing and impact of hearing loss, as well as share information about our project and solicit input into design and implementation. All stakeholder groups, including parents, children, educators and healthcare providers, will be included. Tribal leaders and Alaska policymakers will also be invited to participate in focus groups at the conclusion of the trial. Focus groups and events will be held in at least five communities across the region, with the remainder occurring by video conference to facilitate maximum participation. Video conferencing has been used successfully by Norton Sound Health Corporation for many years to overcome the barrier of distance in this remote region of Alaska. Virtual focus groups will facilitate participation of certain stakeholder groups across multiple communities simultaneously, such as health aides or teachers from across the region. For in-person focus groups, purposive sampling will be employed to ensure that communities are included from each of the four geographic strata used for trial randomisation. Recruitment for focus groups and community events will occur through social media, radio announcements, and flyers in community spaces. All 15 communities will have an opportunity to participate, either through in-person or virtual focus groups. Focus groups will be jointly led by the lead audiology stakeholder and communications outreach specialist. Prior to beginning the session, the leader(s) will request permission to audio record, and an informed consent document will be signed by each participant. If all participants agree, conversation from that point forward will be digitally recorded. If a participant does not agree to recording, but does consent to participating in the focus group, the leader(s) will proceed and will take detailed written notes during the discussion. If an individual wishes to participate but does not want to speak in a group setting, accommodation will be made for one-on-one interaction. Children under the age of 7 will be verbally assented to participate in the focus groups, and children aged 7–17 will sign a child consent. Parent/guardian consent will also be required for all participating children. Stakeholder group will be documented (eg, teacher, health aide). No identifying information will be linked to audio or written transcripts from the focus groups. Approximately 100 interviews will be conducted, with roughly 20 interviews within each of the following stakeholder groups: parents/caregivers, children, teachers, school administrators and healthcare providers. We have specified typical sample sizes but will continue to accrue participants until reaching saturation, such that further accrual will not substantially alter our conclusions.32 Purposive sampling will be employed to maximise heterogeneity of experience, with emphasis on sampling from communities where loss to follow-up of referrals was more common or time to diagnosis was delayed, in order to explore reasons for variation by community and to guide future statewide implementation. Interviews will be divided roughly evenly between communities randomised to the current primary care referral process and expedited telemedicine referral. Interviews will take place in person, by phone or by teleconference. Interviews conducted in person will occur in the participant’s home, in the school or in the primary care setting (or another mutually agreed on private location) at a time convenient to the participant and interviewer. Participants for qualitative interviews will be recruited during visits to each of the communities for trial data collection. Recruitment will involve announcements including flyers, radio and social media, as well as emails to the various stakeholders. Contact information for how to sign up for the study will be provided. Times will be scheduled at central community centres for any individuals who would like to learn more about the study and what it means to participate. We will also ask participants if they will share the contact information of our interviewer with others whom they feel would be interested in participating. Cultural training and education will be provided to team members who are not Alaska Native and/or local to the region. Interviewers will undergo interview training prior to beginning qualitative interviews. Training will highlight the purpose (ie, to elicit rich information in a conversational style) and interviewing techniques.33 Techniques include establishing a proper tone, reflecting on the interviewees comments for clarification or confirmation, probing for additional information on comments relevant to the study topic, respecting silences and pauses, and avoiding interruptions or sudden topic changes. Although the interviewer may point the respondent towards topics of interest, central to the technique is the concept that the themes and issues discussed emerge from the respondent, not the interviewer. Therefore, interviewers must be specially trained and carefully supervised to ensure that they do not lead the content of the interview. We will take several steps to ensure that the interview data we obtain will be of high quality. Initial training will include (a) study of a detailed written protocol and oral review of project methods and procedures, (b) role-playing experience in which the interviewer conducts mock interviews using the semi-structured interview guide and receives in-depth feedback about performance and (c) supervised conduct of interviews with specific feedback. Training activities will be pursued in iterative fashion until the interviewer displays acceptable levels of performance. Weekly meetings will provide the opportunity to review procedures and for troubleshooting. The study team, including the interviewer, will be reviewing transcripts from taped interviews as we proceed so that performance can be monitored and feedback can be provided to interviewers as needed. Reviews of transcripts will continue throughout the course of the study to ensure that high-quality interviews are being conducted. Effort will be made to remain culturally sensitive. Alaska Native team members will review transcripts and interviewer notes for elements important to the culture (eg, meaningful silence, nodding, eye contact, eyebrow raising in sign of agreement). Trained research staff will perform all interviews. The name of the interviewer will be given to the participant, and the interviewer will contact the participant the day before the interview to confirm arrangements. On arrival, the interviewer will identify herself and will confirm the respondent’s willingness to participate in an interview. She will then ask for permission to audio record the interview, and an informed consent document will be signed. If the participant agrees, all conversation from that point forward will be digitally recorded. If the participant does not agree to recording, but does consent to the interview, the interviewer will proceed and will take detailed written notes during the conversation. Participating children will be verbally assented at the time of the interview and only if accompanied by a parent/guardian consent. The parent/guardian will remain present for the interview unless it is mutually agreed on by the study personnel and parent/guardian that the interview be conducted with the parent/guardian outside the room. The semi-structured interview will proceed in two parts, described below. The first part will consist of the freelisting procedure. The second part of the interview will consist of a series of open-ended questions related to hearing loss and delivery of services. Similar to the focus groups, no identifying information will be linked to audio or written interview responses, and thus all qualitative data collected will be completely deidentified. Only the stakeholder group for which the individual is a member (eg, parent, teacher, community health aide) will be documented. Semi-structured interviews will address hearing loss and the screening, referral and treatment process. Interviews will use a set of open-ended questions based on Kleinman’s conceptualisation of an explanatory model to investigate local concepts of illness.38 We also expect to hear stories about help seeking. The questions in the interview guide will reflect the concerns and themes that community members expressed during focus groups preceding the comparative effectiveness trial. Directly following the interview, field notes will be dictated by the interviewer and will include impressions and pertinent data regarding living situation, economic factors, physical disability or other factors that might affect interpretation of the data. All recordings will be returned immediately to the study leadership team, who will log them into a master file and keep them secure awaiting transcription. The data management and analysis plans for focus groups and qualitative interviews are similar and will therefore be described together. Detailed, verbatim transcripts of the focus groups and interviews will be prepared as is standard in qualitative research. Details such as long pauses during interview responses, dramatic inflection or change of tone when speaking (eg, strong emphasis on particular words) and emotional content (eg, laughter, crying) will be noted. Completed transcripts will be checked against the audio recording to ensure accuracy. In addition, the interviewer will keep written notebooks in which to record impressions of the overall interview and to note key observations.39 Any transcription of speech may not completely capture all of the meaning that was intended. Transcription may be considered part of the analysis not just data preparation. For this reason, we will listen to the recordings as well as analyse transcripts. All data collected for focus groups and the explanatory sequential qualitative stage will be deidentified, transcribed and stored digitally in Duke Box (https://box.duke.edu/), a cloud-based server for securely sharing content with authorised Duke and non-Duke users. Audio recordings will be stored at Norton Sound Health Corporation (NSHC) on a secure, password-protected server. If written notes are taken in the interviews, they will be digitised and stored in Duke Box. Any paper notes will be stored at NSHC in a locked cabinet for the duration of the study and destroyed 2 years after close of active enrolment. The purpose of the focus groups and community events occurring before the randomised trial is to maximise community engagement and input in the research process, from understanding cultural perceptions of hearing loss in rural Alaska communities to contributing to protocol refinement. Focus groups after the trial will be focused on sharing results and engaging the community in implementation of study findings. The goal of the semi-structured interviews is to obtain patient, family and organisational perspectives on the screening, referral and treatment process from children, parents/caregivers, teachers, school administrators and healthcare providers. Our study design allows us to make specific comparisons within and across stakeholder groups (obtaining stakeholder perspectives), within and across sites (representing community contexts) and within and across randomised referral pathways. Our analyses will compare not only themes and narratives across stakeholder groups (eg, comparing patient and administrator notions of service delivery) but within stakeholder groups across sites (eg, comparing administrator perspectives across communities). The same analytic techniques will be used for focus group and interview data. NVivo V.11 (QSR International, Melbourne, Australia) will be used to facilitate coding and analysis of qualitative data. Through both broad and fine coding, we will develop and update a study codebook.42 Once a codebook is developed, procedures for attaining reliable coding will be as follows. First, coders will be provided with team consensus-derived definitions. To attain a satisfactory level of insight and agreement, study personnel will perform successive phases of grouping and refining codes. The goal is to gain interpretive insight and understand meaning. New codes may be generated in an iterative fashion based on continuing review of the data and codes. In our approach, informants’ verbatim statements are given priority. First, they are important as statements in and of themselves, revealing not only content but also illustrative tone and tenor of experience. Second, such statements are the basis of instructive case studies. Third, statements (including metaphor and proverb) exemplify particularly common or idiosyncratic experiences or reactions. Fourth, direct statements can enhance accounts of the process of meaning making. We will examine the data according to frequencies across salient groupings (eg, according to stakeholder group or site). Trustworthiness of our data will be enhanced at the data collection phase by regular debriefing with the interviewer to encourage standardised administration of the questions.44 During analysis, several strategies will be used to address trustworthiness, including immersion through close multiple readings and discussion by the team, searches for discrepant cases and debriefing with the interviewer and/or focus group leader. In addition to categorical coding of focus group and interview transcripts, our qualitative analytic strategy will include narrative analysis. Narratives are ‘discourses with a clear sequential order that connect events in a meaningful way for a definite audience'.45 Stories are usually constructed around a core set of facts or life events, yet allow a wide periphery for freedom of expression in emphasis, additions and interpretation. Narratives are never simply reports of experiences. To provide details of a life experience in the form of a story, individuals are asked to reflect on those experiences, to select the salient aspects and to order them into a coherent whole. This process of reflection and ‘making sense’ of experience makes story telling a ‘meaning making’ activity. This analytic strategy complements the theme-based efforts described below by examining data in a holistic, ‘big-picture’, manner, facilitating development of case studies that can be used to illustrate how the processes worked to further discussion and dialogue during focus groups after the conclusion of the trial. Focus groups will occur in the 6 months leading up to the randomised trial (figure 3). Qualitative interviews will occur in the second year of the comparative effectiveness trial to allow stakeholders to accrue sufficient experience with the intervention. The study will close with 6 months of focus groups and community events after conclusion of the trial. Mixed methods research involves the integration of quantitative and qualitative approaches to study design, sampling, data analysis and interpretation.49 Study data will consist of quantitative data described in the companion paper (eg, time to diagnosis, hearing-related quality of life) and qualitative data described in this protocol (ie, text data from semi-structured interviews and focus groups).26 The initial exploratory sequential stage will incorporate stakeholder and community perspectives during protocol refinement, and the explanatory sequential stage will explore stakeholder experiences and insights on how the screening and referral processes worked in practice. A sampling strategy for integration purposively selects individuals who can be most informative of how the processes of the intervention worked, such as seeking perspectives from administrators or providers in settings where losses to follow-up were common or where time to diagnosis was longer. A data analytic strategy for integration involves the use of a joint display. A joint display is an array of quantitative and qualitative data in a table or figure that may bring new insights over using one approach alone.49 50 Using a joint display, we may compare themes derived from interviews and focus groups about the identification and management of hearing loss to measures of time to diagnosis or changes in hearing-related quality of life. The goal of integrating data sources in the context of a comparative effectiveness trial is to provide a more complete, community-centred and patient-centred perspective on the effectiveness of the intervention than would be obtained by relying on clinical and survey data alone. The importance of the mixed methods approach in this study is highlighted by the essential role that qualitative interviews will play in understanding the impact of prior diagnoses on families’ response to follow-up for hearing screening referrals. The Hearing Norton Sound project is a mixed methods community randomised trial evaluating interventions to improve the school hearing screening and referral process in rural Alaska. The study has been approved by the Institutional Review Boards of Alaska Area, Norton Sound and Duke University, and the trial is registered on clinicaltrials.gov (NCT03309553). Dedicated to describing the mixed methods elements of the study, this protocol highlights the centrality of community involvement to the mission of the addressing childhood hearing loss in rural Alaska. Our mixed methods design facilitates community engagement, with focus groups maximising community participation in the research process and qualitative interviews providing enhanced insight into stakeholder experiences with the intervention. The results of qualitative data analysis and conclusions from merging quantitative and qualitative results will be shared broadly in both community and scientific forums. Emphasis will be placed on dissemination of results in participating communities, as well as other regions of Alaska that could potentially benefit from this work. Tribal-related conferences and Alaska news sources will be equally emphasised alongside scientific publication, as the end goal of this project is to implement an improved school hearing screening and referral process across the State of Alaska. Because of the time-intensive nature of gathering in-depth information through interviews and focus groups, a limited number of individuals will participate in the qualitative components of the study. This limitation, which is inherent in qualitative methods, implies that we may miss important viewpoints and experiences from community members and stakeholders who do not participate. A second limitation is the risk of misconstruing or misinterpreting participants’ ideas. We will involve Alaska Native team members in interpretation of interview transcripts and in dissemination of findings in order to minimise this risk. These limitations are counterbalanced by the insights gained from participants, who provide the context and understanding of processes that will be invaluable for elucidating conclusions from the trial and implementing findings. 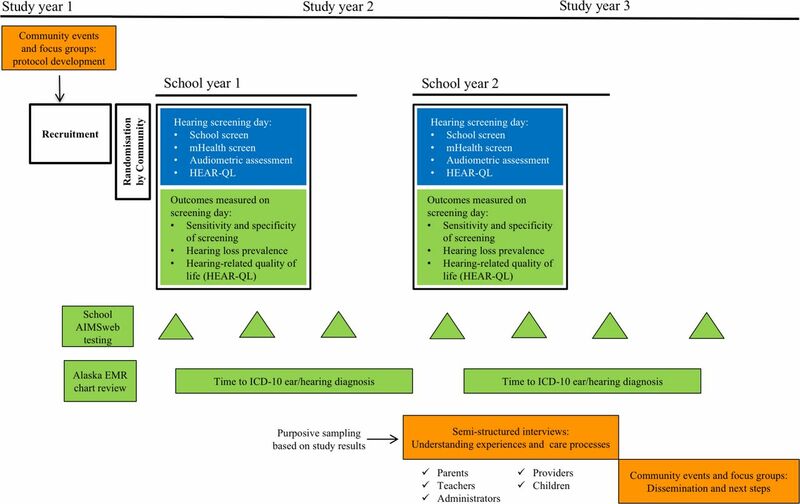 This study has the potential to substantially improve the school hearing screening and referral process in rural Alaska. The qualitative and mixed methods components are just as essential as the randomised trial and will play a prominent role in establishing study conclusions. Our patient-centred approach places participating communities at the core of developing a solution to childhood hearing loss in the region, from participating in study design to sharing experiences with the intervention and advising on implementation of a solution. At the conclusion of the study, our goal is to implement a screening and referral protocol statewide that has been built on community input, reflecting a locally derived, evidence-based solution to address childhood hearing loss in the State of Alaska. Beyond the subject matter of the study itself, this research brings stakeholder leadership and mixed methods methodology to a population that has experienced historical trauma. Providing patient, parent, educator, healthcare provider and Alaska Native perspectives, our Alaska stakeholder team has been involved from the conception of the study. The high value we place on community input, integrating multiple avenues for community involvement in the research process and development of study conclusions, emphasises the essential role that communities play in developing solutions to public health challenges. 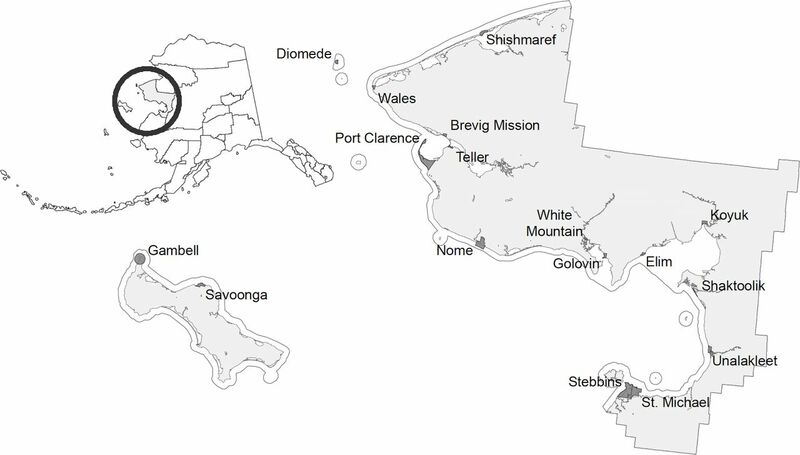 We hope that this project opens new dialogue in the Norton Sound region on the value of patient-centred research and the merit of collective engagement in addressing health disparities. This work may serve as a model for community-based research in the State of Alaska and in other rural communities in the USA and abroad. The authors acknowledge the Alaska stakeholder team for their contributions to the project: Laureli Ivanoff (Communications Outreach Specialist), Paul ’Bebucks' Ivanoff (Lead Parent Stakeholder), John Kokesh (Lead ENT Stakeholder), Stephanie McConnell (Patient Partner) and Patricia ’Patty' Vink (Lead Education Stakeholder). Most of all, they thank the participants, whose support is vital to the success of this community-based endeavor.
. Long-term effects of otitis media: a ten-year cohort study of Alaskan Eskimo children. Pediatrics 1973;52:577–85. Alaska Statutes. 2015 http://www.legis.state.ak.us/basis/statutes.asp#14.30.127 (Accessed 23 Jul 2018).
. Designing and conducting mixed methods research: SAGE Publications, 2017.
. Mixed methods in behavioral intervention research. In: Gitlin LN , Czaja SJ , eds. Behavioral intervention research. New York: Springer Publishing Company, 2016:195–211.
. A profitable conjunction: From science to service in children’s mental health. In: Burns BJ , Hoagwood K , eds. Community treatment for youth: evidence-based interventions for severe emotional and behavioral disorders. New York: Oxford University Press, 2002:327–38.
. Hearing Norton Sound: a community randomized trial protocol to address childhood hearing loss in rural alaska. BMJ Open 2018. Under review.
. The American indian holocaust: healing historical unresolved grief. Am Indian Alsk Native Ment Health Res 1998;8:60–82. Executive Office of the President. 2014 Native youth report. 2014 https://obamawhitehouse.archives.gov/sites/default/files/docs/20141129nativeyouthreport_final.pdf (Accessed 11 Jul 2018). Alaska Department of Labor and Workforce Development. Alaska population overview - 2013 estimates. 2015 http://live.laborstats.alaska.gov/pop/estimates/pub/13popover.pdf (Accessed 11 Jul 2018).
. The quality of mercy. caring for patients with ’do not resuscitate' orders. JAMA 1992;267:682–6.
. Structured interviewing and questionnaire construction. Bernard HR , ed. Handbook of methods in cultural anthropology. Walnut Creek: AltaMira Press, 1998. Dressler WW, Oths KS. Cultural determinants of health behavior. Gochman DS , Handbook of health behavior research i: personal and social determinants. 1. ed. New York: Plenum Press, 1997:359–78.
. ANTHROPAC 4.0 methods guide. Natick, MA: Analytic Technologies, 1996.
. Systematic data collection. Newbury Park, California: SAGE Publications, 1988.
. Patients and healers in the context of culture. Berkeley and Los Angeles, California: University of California Press, 1980.
. Research interviewing: content and narrative. Cambridge Massachusetts: Harvard University Press, 1991.
. Qualitative data analysis: an expanded sourcebook. 2 ed. Thousand Oaks, California: Sage Publications, 2004.
. The science of qualitative research. New York: Cambridge University Press, 2011.
. Introduction. In: Hinchman LP , Hinchman SK , Memory, Identity, community: the idea of narrative in the human sciences. eds. New York: State University of New York, 1997.
. The discovery of grounded theory: strategies for qualitative research. New York: Aldine Publishing, 1967. Contributors PH and SDE are principal Investigators and direct all study activities and coordinate team members. Study design: all authors. Analysis design: all authors. Protocol generation: all authors. Funding This project was supported by the Patient-Centered Outcomes Research Institute (AD-1602-34571). Ethics approval This trial has been reviewed and approved by the following Institutional Review Boards: Alaska Area, Norton Sound, and Duke University.